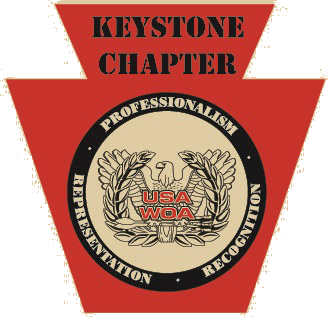 As the Warrant Officer Legislative Representative for the Keystone Chapter of the Warrant Officer Association, as well as the Warrant Officer Representative for Region II for NGAUS I wanted to provide the following updates on Warrant Officer issues that may be of interest to the Warrant Officers within the Pennsylvania Army National Guard. Last year NGAUS spent a lot of time working with the states on issues specific to ARI and the transition taking place throughout the National Guard. The Commission made several critical recommendations that are being worked in the greater good of the National Guard, and in part the Warrant Officer Cohort. MOS transition funding for schools based on ARI is a critical issue every that is affecting every state and territory. The NDAA has NOT taken into consideration the total cost for COMPO 2 units to send Warrant Officers to new schools to address lost or converted MTOE slots. NGAUS is asking DoD to fund the NG for ATRRS schools to ensure the transitions are completed within the mandatory timelines. The Warrant Officer Association is also working this as a priority. APFT for Warrant Officer positions with combat only related wavers has been an ongoing fight as it directly affects who we are Warrant Officers can recruit. The Warrant Officer Cohort’s main recruiting area is from the Enlisted ranks, specifically E6 and above as our primary target to start. Since these Enlisted soldiers have been in the service a long time we have maintained that it makes no sense to limited their selection as Warrant Officers based on the need to complete and Alternate APFT event. The latest update is that the new draft of AR 350-1 is expected to be out by 1 February 2017. Of special interest to the WO cohort is the expected revision of paragraph 3-13j(3) which will update the waiver process and standards for candidates applying to WOCS to pass the standard three-event APFT as an enrollment requirement. The new policy is expected to allow waivers for any of the three events, not just the run event, and remove the standard that requires the permanent profile must be a result of extraordinary circumstances, i.e., combat related. If amended as expected, this new policy will allow many more applicants to apply for the APFT waiver as a result of a permanent profile regardless of the circumstances. Lastly, with the 100 year anniversary of the Warrant Officer approaching, we are working to create a Nation Wide acknowledgment of this at the political level. The intent is to ensure the Warrant Officers are recognized as an critical part of the Military system. Stay tuned as this develops.